Teach Love Laugh: Quick Giveaway ~ Fingers Crossed! 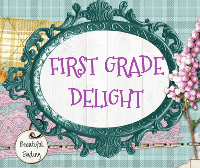 The super cute First Grade Delight is having a quick giveaway! Head on over and enter! Also show her some love, she just passed the 200 followers mark. Yippy! Click on the button below to head over to her blog.